What??!! 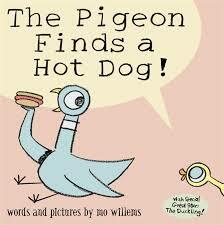 You’ve never heard of Mo Willems’ Pigeon? I had the great fortune to meet the Pigeon for the first time in 2008, in a fabulous basket full of great children’s books given to me by my then managers as a baby shower present for my first child. As Baby I grew and became a little book fiend, I started reading to her The Pigeon Wants a Puppy, which always got her laughing out loud. Very soon she even knew some of the parts of the book, and would react to them before I even read the page. 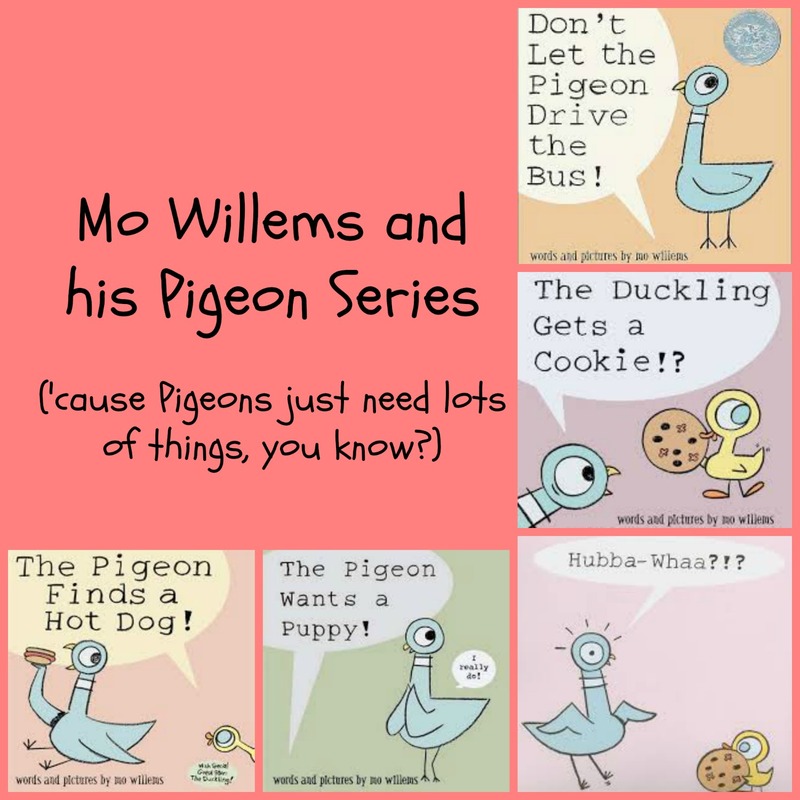 As the years went by, I bought a few more books, and then, when I started the blog, I wanted to make a spotlight on Mo Willems and his Pigeon books. As I don’t own them all, I took a few out of the library to write this post. So… who is the Pigeon? The Pigeon is every single little kid out there, and it behaves and reacts like any pint-sized creature would. That is what makes the series so lovable and great for young kids. Mo Willems, who started writing for Sesame Street and now is one of the most loved children’s book authors, understands perfectly the child’s psyche. With every story, he lays down on the page funny and simple drawings and witty dialogue. All his stories are about things children care about, such as wanting a pet; or not going to bed; or do or have things that they are not allowed to. The first book of this series, and winner of a Caldecott award, is about the Pigeon wanting to drive a bus… after Mo Willems’ “picture” as the driver asks us specifically NOT to let the Pigeon do just that. The book is a sort of dialogue between the Pigeon and the kids reading the story, where the Pigeon gives all sorts of reasons, begs, pleads (and sometimes even throws a fit) to get what it wants. Introducing the Duckling, this little story is very much about sibling rivalry… and about little cute brothers or sisters outsmarting the older kid. A very funny story with a great twist at the end. 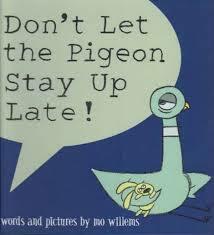 In this book the Pigeon does all it can to convince us to let it stay up late and have a hot dog party… or just talk. As we haven’t talked in such a long time… With Knuffle Bunny as a special guest, this book is great for Kids who have a hard time going down for the night, exploring each and every one of the kid-like strategies and excuses they try to pull. 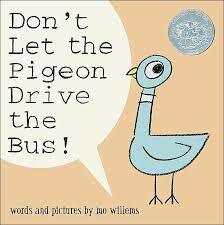 This one is my favorite, as it was the first Pigeon book my daughter and I read. It’s perfect for that time when the kids start pressing for a pet. 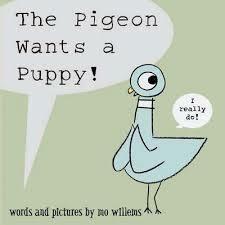 The Pigeon wants a puppy. It really really wants one (since last Tuesday)… and it promises to water that puppy once a month (cross its heart and hope to die). The Duckling is back, and this time it has a cookie. And with nuts!! And he got it just by asking (politely)!!! Life is not fair if you are a Pigeon that pretty much wants everything. This is the last book of the series, just published last year. This time the Pigeon stinks to high-heaven… but it just won’t take a bath. No matter what we say. No matter how bad the stench is. No matter that the flies won’t even come close to it! Can you just guess where this story ends? While researching this post, I came by the Pigeon’s own page, an app and even a Twitter account! Mo Willems also has a blog called Mo Willems’ Doodles, as well as a few others you can find here. My work in children’s books, TV, theater, and bubble gum card painting have garnered 3 Caldecott Honors, 2 Geisel Medals, 5 Geisel Honors, 2 Carnegie Medals, 6 Emmys, and multiple bubble gum cards. Here’s a book pubilshed in 2012 with his bio, if you are interested in knowing more about him. As a mini-bio stitched together from what I found on the web, Mo Willems graduated from NYU’s Tisch school of Art, and he worked in TV until he quit to be a full time Dad. That’s when his career as a book author started, and his sensitivity and humor have garnered him all those awards mentioned before… as well as countless smiles from children and their parents while reading his wonderful books. Tagged Author Spotlight, Book reviews, Picture Books. Then I’m very happy I wrote it! I’m sure you’ll love them, Catherine! Thanks for stopping by! Yay! So glad I rekindled your fondness for the Pigeon! And now with the new sibling on the way, you definitely need more with the Duckling! Thanks for hopping on by! That pigeon is irresistible and so popular! Stopping by from the Kid Lit Blog Hop. We love that adoringly irreverent creature! Thanks for stopping by! 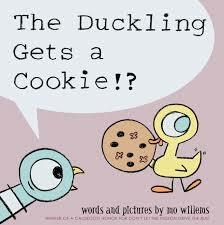 Mo Willems just gets kids, doesn’t he? We never read the pigeon books, but my kids loved the Elephant and Piggie ones. Thanks for sharing in the Kid Lit Blog Hop! 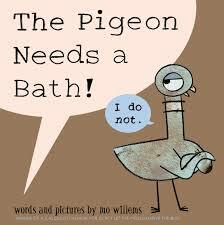 We absolutely love Mo Willems and his books. The Pigeon ones were always a favorite among my boys and even though they are now 17 and 15 I couldn’t part with our collection and have them packed away! Thank you for sharing your post on the Kid Lit Blog Hop. Well, I’ll make sure to let Renee know that her kids are not to old for it, then! Thanks for visiting!